This problem started when I tried to login to my brand spaning new VPS server. I remember that in my first SSH try on the server I actually got prompt for password several times which would mean that there is no port blocking problem from my isp. Since the password did'nt work for me (for some reason). I had a lot of authentication failure. After that attempting to log in to the server just timed out. I did the same at mediatemple (which used to work before with sftp) and put in wrong password and now trying to ssh (or even SFTP) gives me timeout error. So some kind of security feature is preventing me from trying too many times to log in, either from my side or from the server side. Any idea what it could be? debug1: Connecting to 87.117.249.227 [87.117.249.227] port 22. Could not create directory '/home/pavs/.ssh'. RSA key fingerprint is 33:24:1e:38:bc:fd:75:02:81:d8:39:42:16:f6:f6:ff. Failed to add the host to the list of known hosts (/home/pavs/.ssh/known_hosts). Most likely this is due to fail2ban. If you fail to log in too many times, fail2ban places a temporary IP ban on you causing connections to fail. If the password is incorrect, don't keep repeating it. Figure out what's wrong and fix it. If they truly do have some sort of IP block on you, you could try from a different IP (a friend's place?) Otherwise, if it's based on your username, try sending another username and see if it times out. If it doesn't, you'll need your user account re-enabled. If it does, try the new IP thing. If neither works, you're definitely stuck with getting support from your provider. This issue must have popped up enough at MT that they allow users to fix it now. After attempting to SSH with the wrong username command 10 times MediaTemple blocks your IP. To solve, log into the MT Account Center and go to Dashboard. 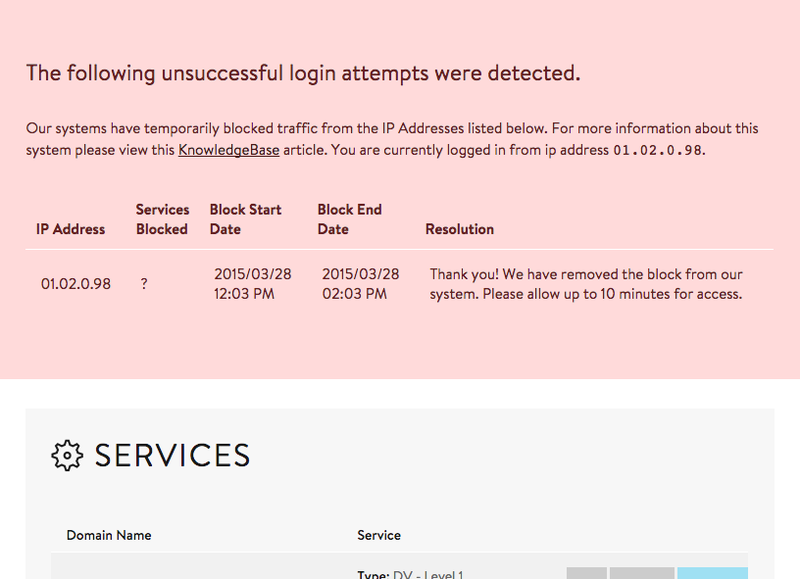 A big red message shows you that the IP is blocked and allows you to click "unblock", which results in the screen below.